Discover trustworthy, verified and legitimate Amazon product manufacturers. We do all the research from the best e-commerce sites and put up a list of the best suppliers for product sourcing. The perfect tool for a full-time or a part-time Amazon seller. Mine thousand’s of manufacturers to isolate those best suited for sourcing with the right quality. Complete tools for analyzing the viability of the product. Predetermine the profits, expenses before you source. Our algorithms allow searching for manufacturers from reliable sources for a positive ROI. Generate profits by efficiently sourcing fast selling products from legitimate manufacturers to sell it for the best profits on Amazon. Finding the right product to sell is indeed a most crucial step in the Amazon business, however, the quality of the product and the profit margins root from the sourcing decisions. The smart filters in the Product Sourcing tool help you choose the best manufacturers. Search filters make it easy to see exactly the types of products you want to sell and that they meet your business model's criteria. Search by the quality of products, reviews from fellow Amazon sellers and manufacturer ratings to cherry pick the best of them. Compare them side by side to find the best manufacturer. Go through key data like the price range, price minimum transaction price, order sales, etc. Factor in customized costs, minimum order numbers, product weight to analyze data quickly to make buying decisions. The Amazon Product sourcing tool coupled with the Product Research tools can help you track down the most profitable Amazon opportunities and source them for the best profitable rates. Research, and analyze the investment and ROI estimates with the aid of the Product Sourcing tool, to choose the best product for your Amazon business. 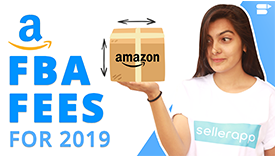 Amazon FBA Sourcing made easy! How does SellerApp’s product sourcing tool help me? Is it easy to source products for FBA and sell it with profits? How much does it cost to sell on Amazon FBA?